12 lb covers 1,200 sq. ft., 40 lb covers 4,000 sq. ft.
Prep - Mow the area to a height of approximately 2 inches or lowest mowing setting. Rake or de-thatch to loosen the top layer of soil and remove any dead grass or debris. Apply - Use a Scotts® spreader to apply. Water - Water daily or as needed to keep soil surface moist for the first 2 weeks. Resume mowing when lawn reaches desired mowing height. Apply only to actively growing turf. Do not apply near water, storm drains, or drainage ditches. Do not apply if heavy rain is expected. Apply this product only to your lawn and sweep any product that lands on the driveway, sidewalk or street, back onto your lawn. Fall and Spring are the best times to use Thick'R LawnTM. Seed germinates best anytime temperatures are between 60°F and 80°F and all danger of frost has passed. 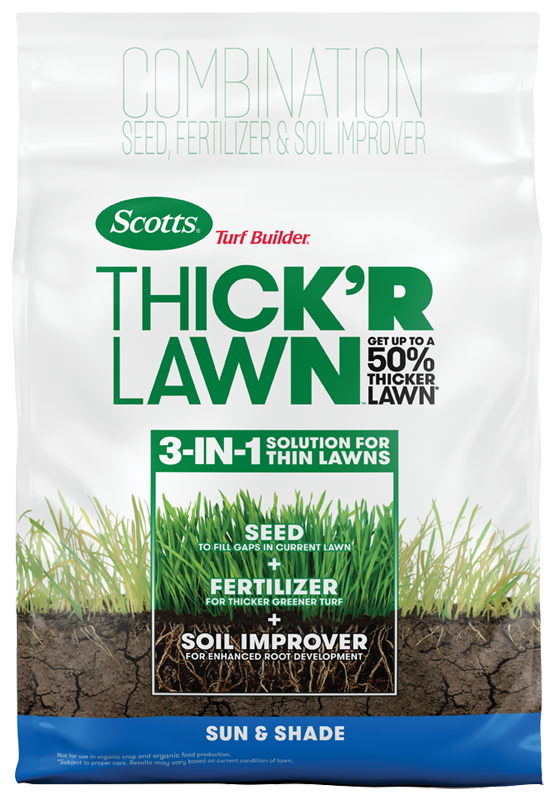 Scotts® Turf Builder® Thick'R LawnTM is a great addition to your lawn care program with 1 application in the spring and 1 application in the late summer/early fall. Resume mowing when the lawn reaches desired mowing height or about 3 inches. Water daily or as needed to keep soil surface moist for the first 2 weeks. Your existing grass will start to green and seeds will begin to germinate. Be patient and keep the area moist by watering often. The seedlings are more visible now and your existing grass is thicker, with a deeper green. Congratulations, you did it! Enjoy your thicker, greener lawn! Everything you need to help turn weak, thin grass into a thicker, greener lawn. Subject to proper care. Results may vary based on current condition of lawn. 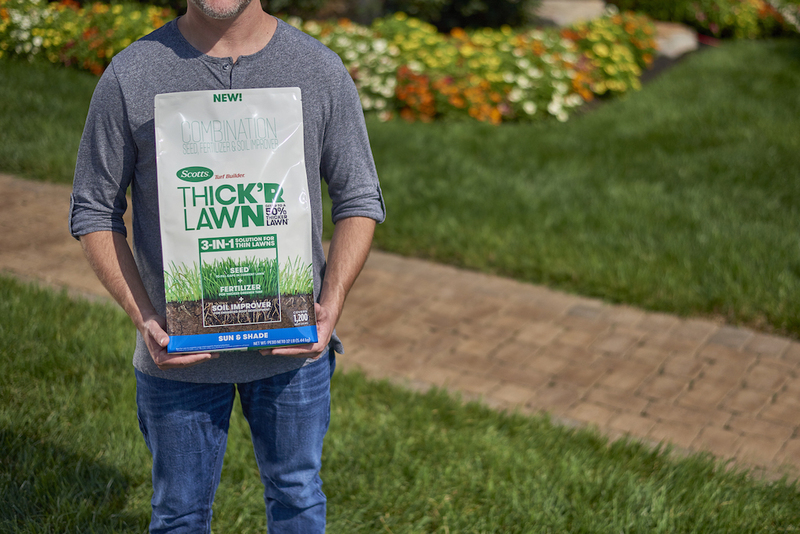 Thick’R Lawn contains seed to fill gaps with new grass, fertilizer to feed new grass plus thicken and green existing turf and soil improver for enhanced root development. It’s easy to use: first calculate the size of your lawn with the Scotts My Lawn app to determine coverage amount. Then pour product into your spreader and adjust setting per the product label requirements and apply. Apply to your entire lawn using a Scotts spreader. 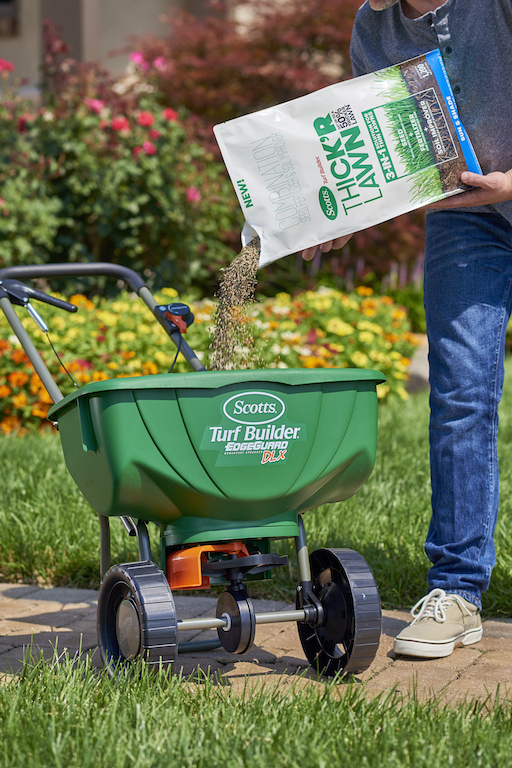 Scotts® Turf Builder® Thick'R Lawn™ Tall Fescue Mix has everything you need to help turn weak, thin grass into a thicker, greener lawn, guaranteed!